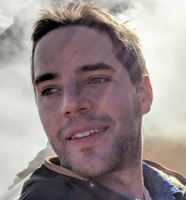 Ben Holmes is the CEO and creative lead at AERONAUT Brewing Company and a researcher of biotechnology and machine learning at MIT & the Broad Institute. Coming from a background in science, art and eduction, including working on the Mars Rover project and teaching in the middle east, Ben's passion is to discover creative ways to share ideas that matter. He is an National Science Foundation graduate fellow and his work at AERONAUT has been recognized with a number of regional and international awards for beer and communications.